On Tuesday 7 November 118 Tiffinians sat the UKMT Senior Maths Challenge. We have become accustomed to excellent results and this year was no exception with 41 boys qualifying for the two prestigious follow on rounds. In addition Vincent Trieu achieved full marks on this paper – a very rare feat. This week we have received the results back from the UKMT Kangaroo competition (one of the follow-on rounds). A remarkable 13 boys have achieved a certificate of merit – the highest possible achievement in the Kangaroo paper and roughly equivalent to being in the top 2000 Sixth Form mathematicians nationally. 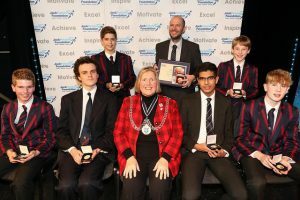 The results from the 9 boys who qualified for the other follow-on round, The British Maths Olympiad, are still awaited. 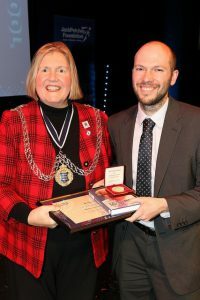 On Wednesday, 22 November Tiffin’s Jack Petchey award winners were presented with their awards by the Mayor of Kingston, Councillor Julie Pickering, at the Richmond Theatre. These boys were nominated by their peers and chosen by the school council for these awards based on their significant contributions to the Tiffin community. Dr Frost was also given the prestigious Jack Petchey Leader Award for his phenomenal contribution to Tiffin through his excellent teaching and the provision of his website www.drfrostmaths.com, which receives about 50,000 hits a day and is having a major impact on maths teaching around the globe. Dr Frost is pictured below. 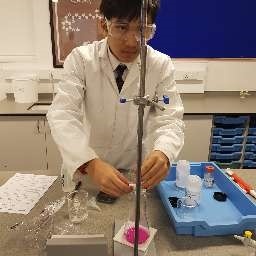 For the second year in a row the finest Chemists from Years 9, 10 and 11, facing stiff competition, went on to win the regional heat of the Royal Society of Chemistry’s Top of the Bench competition. The event on the 16 January at Reed’s School in Cobham consisted of a practical test and written quiz sat individually by all the boys. The winning team not only beat the next nearest team by 12 marks but also Linn Lu was the first boy this year to get full marks on one round! We are waiting to see if the boys will progress to the next round (it’s looking likely!) but what a fantastic result! Congratulations to Jack Yu 9CCC, Alistair Brendon 9RC, Jacob Maynard 10KB and Linn Lu 11AN.